In 2003, Arlington Echo Outdoor Education Center began to partner with the Anne Arundel County Department of Public Works (DPW) to install ecosystem restoration projects to address stormwater issues. These innovative solutions represented a paradigm shift away from “collect and convey” toward mimicking nature to clean, cool and infiltrate stormwater. As school children and their parents toured these sites, planted native plants and learned about stormwater, they began to understand their role in Bay restoration. Communities began to ask what more they could do to help restore their creek, river or the Bay. As Arlington Echo and DPW staff began to work with these communities, they quickly understood that they were outnumbered by people wanting to take action. Each of these communities needed someone to work with them, but there were not enough staff resources at either Arlington Echo or DPW to capitalize on all of the enthusiasm. In 2005, Ron Bowen and Ginger Ellis of DPW began meeting with Stephen Barry and Suzanne Etgen of Arlington Echo to brainstorm ways to turn this growing awareness into action. Over the next 2 years, and 100s of hours, the Watershed Stewards Academy concept was born. After pitching the idea to David O’Neil (then of Chesapeake Bay Trust) and Verna Harrison (then of Keith Campbell Foundation), DPW secured three years of funding for program development. Soon Carrie Decker of the MD Department of Natural Resources approached DPW about funding WSA with a small pot of NOAA Coastal Communities money. In December 2008, a staff person, Suzanne Etgen, was dedicated to work with the program and WSA was born. 10 years ago this week WSA was born. On December 8, 2008, the WSA founders (Ron Bowen, Ginger Ellis, Stephen Barry and Suzanne Etgen) invited about 40 partners consisting of RiverKeepers, landscape architects, local government leaders and environmental advocates, to help in the formation of key aspects of the program: Curriculum, Tool Box for Sustaining Action and Consortium of Support Professionals. A kickoff meeting was held in the Great Room at Arlington Echo, committees were established and less than 3 months later, WSA began training our first class of 32 Master Watershed Stewards. In spring of 2010, the Chesapeake Bay Program, impressed by the power of citizen stewards engaged through WSA, wrote the replication of WSA into their strategy to address President Obama’s Executive Order for Bay Restoration. WSA formed a strategic partnership with the University of Maryland Seagrant Extension, to help propagate WSAs. There are now established WSA programs in the National Capital Region (Montgomery and Prince Georges County and DC), Howard, Harford, St. Mary’s and Cecil Counties. Additionally, WSA has been replicated in Pennsylvania, upstate New York, and Minnesota. Our Vision… Every community in Anne Arundel County is actively engaged to ensure clean waters. 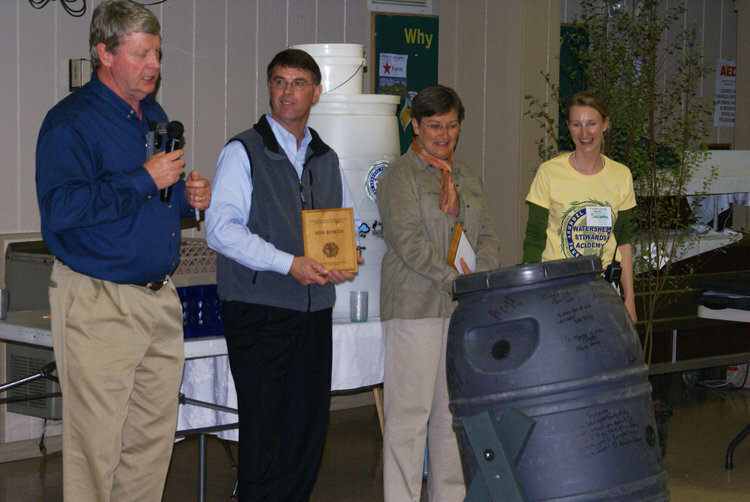 Our Mission… To develop citizen leaders to foster community change for clean waters.